Remember when book parties were lavish affairs? I once attended a book launch party on the selling floor of Cartier on Fifth Avenue. In order to grab for the glam hors d'oeuvres passing by, a girl could set her champagne flute down upon a glass-topped case containing several million dollars worth of jewelry. These days, book parties are author-funded. 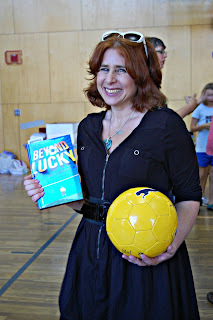 And tonight I went to a highly evolved 21st Century launch party for Sarah Aronson's excellent middle grade novel BEYOND LUCKY. 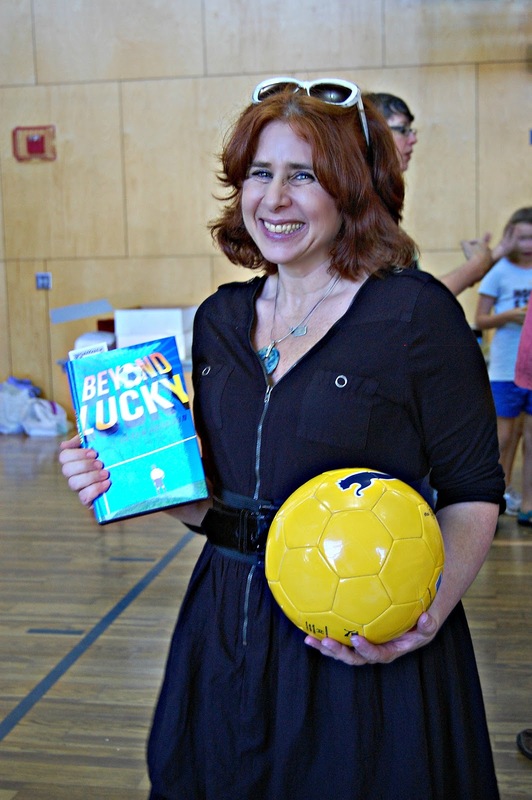 Not only did Aronson theme her party on her sporty book, she went the extra mile. Proceeds from a silent auction and raffle will benefit the non-profit organization Grassroots Soccer Intl., which works to prevent the spread of AIDS in African youth through the power of soccer. The main character of Aronson's novel, Ari Fish, wants to be the starting goalie of his soccer team. Yet he faces a moral dilemma, and he's studying for his bar mitzvah. "He wants to do the right thing," says Aronson. "And so do I." Heroism is a big theme in the book. So instead of throwing a book launch party only in glory to herself, Aronson made it something bigger--something inspirational. And it isn't any harder to plan a benefit party than an ordinary one. In fact, it may be easier. Locations and vendors may be more flexible on price when the party is for a good cause. Aronson used Inlu.com to collect donations for her cause. The Norwich Bookstore set up a table in the corner and sold books to guests. It wasn't Fifth Avenue, but there were Zabars black-and-white cookies for all the guests. Beat that, Cartier. Ideas, ideas, ideas. My head is swimming. First I have to get the thing published, but it cant hurt to start planning. Fabulous! I've started trying to tie client promotion efforts in with charitable opportunities. It's a boost for the charity, and in our increasingly altruistic society (yay), it's a boost for the marketing efforts as well. Thanks for sharing this. I also love the idea of theming events in line with the book. You've got my wheels turning! The idea of having a book event with a focus on service is very appealing--a true win/win.